Krishi Vigyan Kendra Srinagar was sanctioned by ICAR vide their communication NO: 5-9/99/AE-II dated 8th July, 2002 at K. D. Research Station, Old Airport. The Kendra came into operation in the year 2003 and was envisaged to act as innovative institutional model for assessment, refinement and on-farm demonstration of agricultural technologies and training of trainers and farmers. The Kendra works under the aegis of Sher-e-Kashmir University of Agricultural Sciences and Technology of Kashmir and it’s realm of responsibility includes the whole District Srinagar. Krishi Vigyan Kendra (the Farm Science Centre) is a noble concept developed by Indian Council of Agricultural Research (ICAR) which rests upon a solid base of transfer of technology from laboratory to farmer's field with respect to Agriculture, Horticulture, Animal husbandry, Floriculture. Bee keeping, Mushroom Cultivation, Broiler Farming and allied subjects. As per the recommendations of the Education Commission (1964-66) and further consideration by the Planning Commission and Inter-Ministerial Committee, the ICAR decided to establish Krishi Vigyan Kendra (KVK) in the Country. First KVK as established in Pondicherry during 1974. Till the end of IX Plan (2001-02) within a span of 27 years the Govt has approved establishment of KVK's in all the 578 districts in the country. In the last three years (2002-2005) 178 KVK's have been sanctioned including 128 during 2004-2005. At present there are 488 rural districts covered with KVKs including all the districts of J&K state. The Council has a plan to set up KVKs in the remaining districts during the X Plan period. The facilities created through the network has benefited a large number of farmers in the past through out the country. Kashmir, where farmers are faced with prospects of poor yield and low income, could well take cues from the success story of a farmer who is earning a net annual income of Rs. 3.5 lakhs from 2.0 ha land by adopting integrative farm techniques and optimum resource utilization. 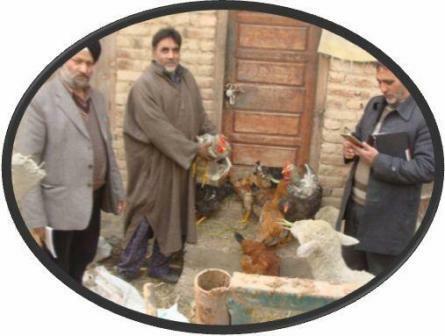 Mr. Farooq Ahmad Wani (40) S/o Ghulam Mohammad Wani hailing from Katti Mohalla, Khonmoh in district Srinagar has set himself as a role model for the farmers. Mr. Farooq Ahmad Wani has developed the farm in the sloppy undulating terrain by successfully adopting suitable soil and water conservation methods such as terracing and water harvesting. All rights reserved Krishi Vigyan Kendra Srinagar.